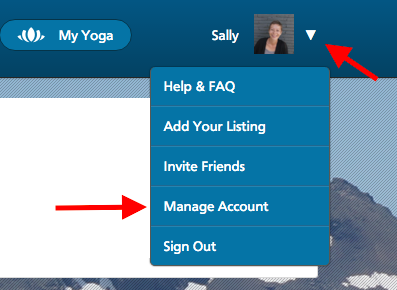 Your account settings page is where you can change your password, the email address for your YogaTrail account. 1. Please make sure to log into your account first, by going here. Enter your email address and current password and click 'Log in'. 3. Find the drop-down menu at the top right (next to the 'My Yoga' button). After changing anything in your account settings, please remember to click 'save' before leaving the page.